Looking for insider tips on things to do in New York City? As part of our city guides series, we chatted with Kate Voyage who has visited New York City 10 times since 2003, and since 2007 has been spending July and August there each year. Kate shares with us her local tips on the best things to do in NYC including where to eat, sleep, drink, shop, explore and so much more! It’s got energy and personality like no other city. All the attractions (food, theater, art, parks) are world class. 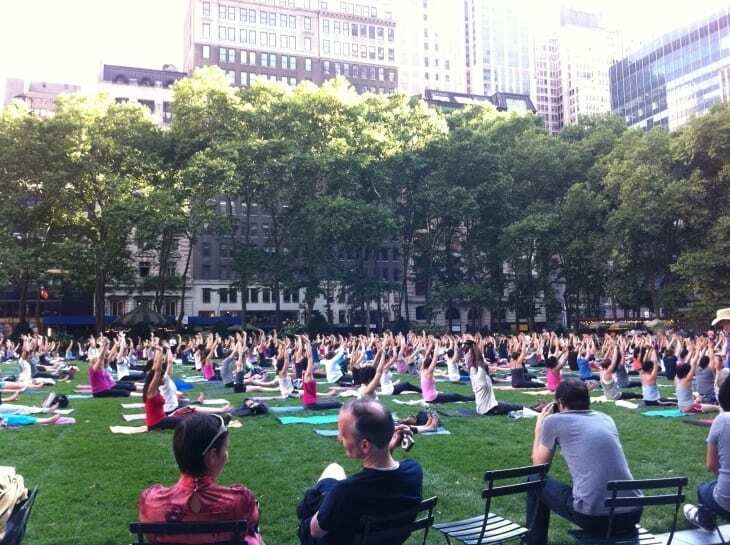 Free yoga in Bryant Park? I love big glitzy Broadway shows. Go to at least one during your trip to New York. To get an idea of what’s on and popular vs. not popular, check out the Broadway grosses and look at the percentage of seats sold and average ticket price. Unless a show is selling out, you can easily Google for discount codes. Using online discount codes will save time and usually give you better seats compared with using the discount TKTS booth that’s in Times Square. You can typically use the discount code at the box office to save online booking fees. 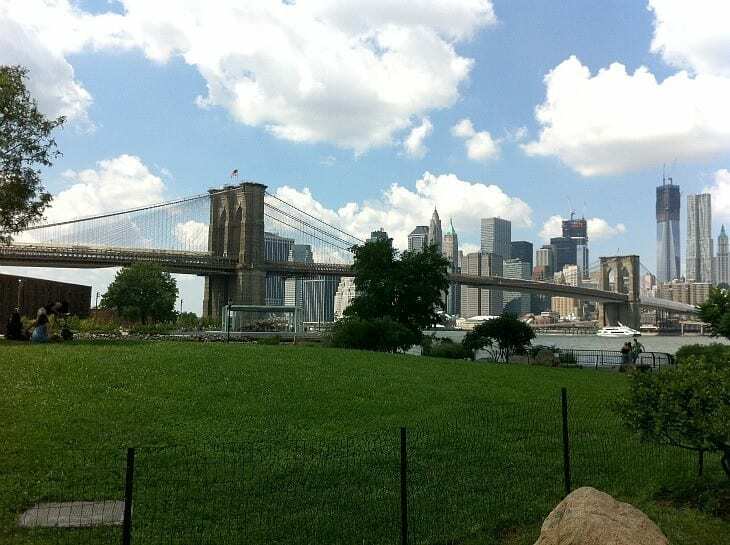 Biking around Central Park (one of the most famous places in New York) and then over the Brooklyn Bridge from Brooklyn to Manhattan are other top things to do in NYC. You can hire bikes online here or take a bike tour. 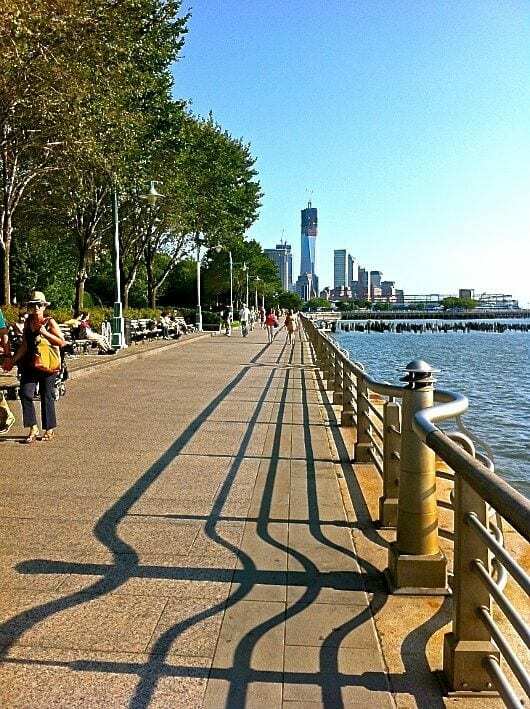 Or walk around one of these other parks in NYC. 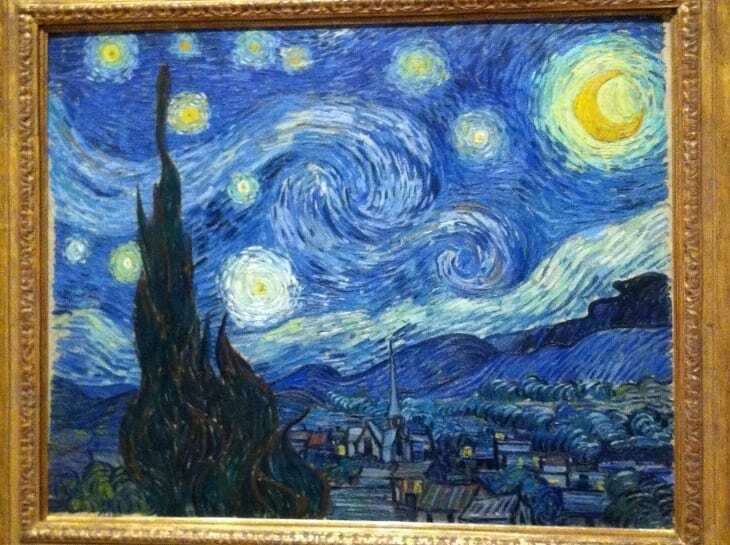 Van Gogh’s Starry Night painting is at the MOMA (The Museum of Modern Art). You can get in free from 4.30-8pm on Fridays. Other major museums include the Metropolitan Museum of Art “the Met” (admission is by suggested donation, you do not have to pay the full amount), the Museum of Natural History, and the Guggenheim. I personally like the Frick. 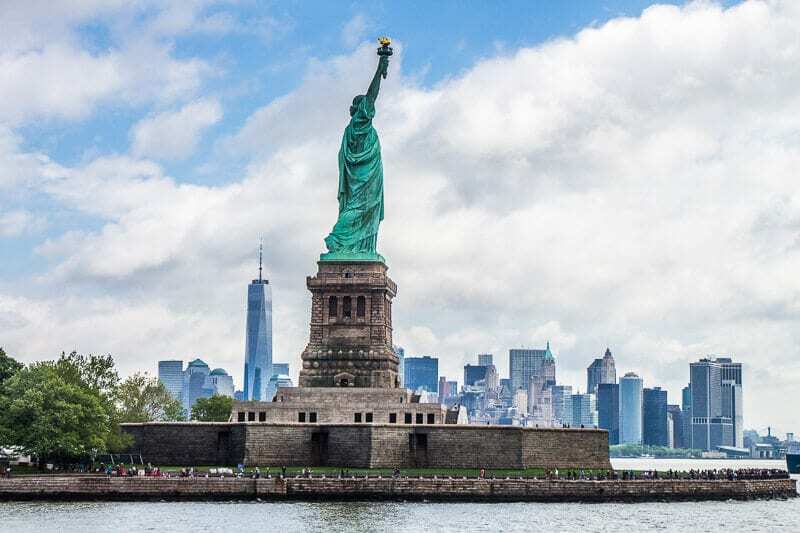 Viator is a Trip Advisor company and offers small group tours of NYC, plus passes and tickets to the most popular places and attractions including the Empire State Building, Statue of Liberty, and One World Observatory. I spend most of my time in the theater district and the east village neighborhood. They are my favorite places to visit in New York. 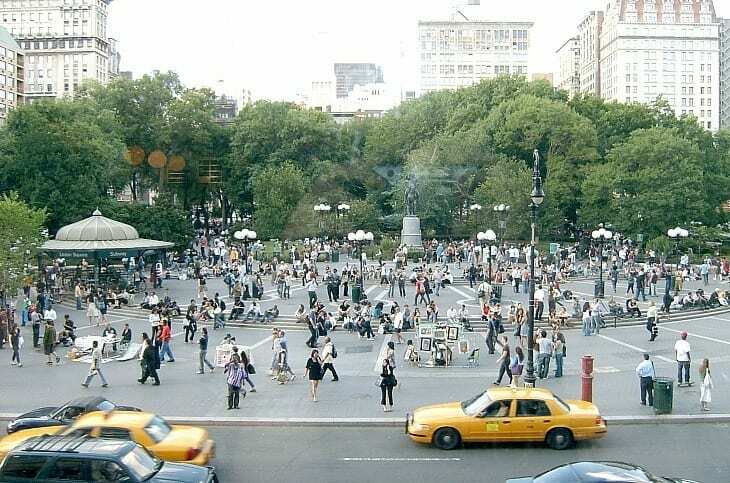 For the east village, go to Union Square at the intersection of Broadway and 14th St. The theater district is Broadway from 42nd St to around 52nd St. The main entrance to Central Park is at 59th St.
From Union Square you can take the 14th street bus West over to the Highline, a former elevated train track that has been turned into an urban park in the sky. It’s concrete with some plants rather than the grass you’d expect of a park, but it’s still nice. Looking for free things to do in NYC? A great walk is just up or down the length of Broadway. Each 20 numbered blocks is around 1 mile, so 14th St to 44th St (30 blocks) is 1.5 miles. Note that this doesn’t apply to the avenues, only the streets. I would skip Little Italy or Chinatown (unless you’re going to Chinatown to eat). For Brooklyn, you can take the L Train to hipster central Williamsburg or take a stroll around Dumbo, Brooklyn Heights, Fort Greene, or Park Slope if you’re keen to venture beyond Manhattan. 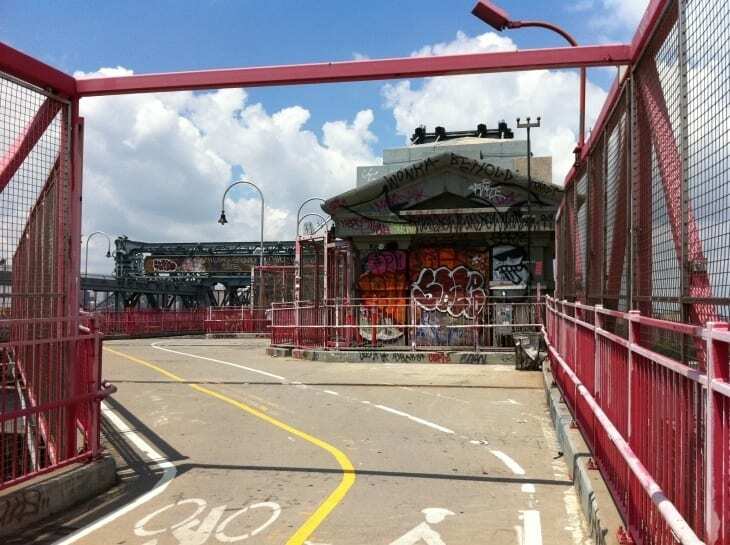 These are nice places to stroll to see Brooklyn, which has its own unique character separate from Manhattan. Ok, what to do in New York City if you’re hungry. Yelp.com is great for NYC food recommendations. If you want to know which restaurants are currently the trendiest, try NY Mag’s Grub St blog. Grub St also tends to have good information about the possibility of getting reservations. Some super trendy places have no reservations policies and the wait can be up to 3 hours. For cheap eats, my favorite is Taim falafel bar in the West Village. They also have a new falafel truck. Their falafel is consistently on NYC’s best lists. It lives up to the hype, and it’s vegan. 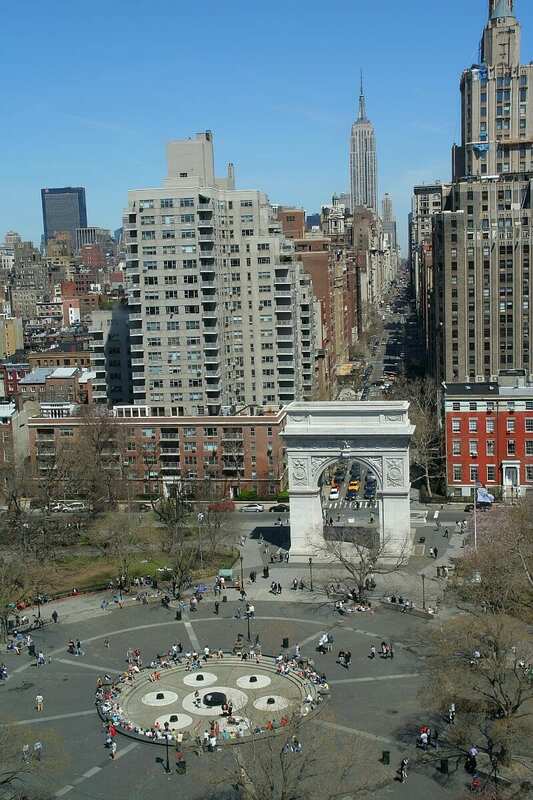 Another street food favorite is the dosa vendor in Washington Square Park (lunchtimes). For coffee, I like drinking Stumptown cold brew in the lobby of the Ace Hotel (on 29th St, near Broadway). This hotel lobby has seating and is a great place to have a quiet meeting. Joe in the West Village is also a popular coffee option. It’s close to Taim falafel. If you’re in the mood for gelato after (or before) walking around Central Park, there is a branch of Grom Gelato, near the Columbus Circle 59th st entrance. “For restaurants, you have hundreds of options. You’re in the restaurant capital of the world”. Pok Pok NY is new and hot for Thai. Michael White’s Marea is consistently recommended for Italian. All the way up the scale, you can go fine dining at Per Se, Daniel, Jean George, and Le Bernardin. Think of all your favorite judges from Top Chef, Google their restaurants, and then check previously mentioned Grub St for hints on getting reservations. If you want to be cooler, you can try Brooklyn hotspot Franny’s. Chowhound Manhattan is another excellent way of doing foodie trip research, and you can even view menus in advance on Menupages. NYC restaurants are known for being very crowded and discourage lingering with design elements like backless seats. Do some research before taking your parents to trendy restaurants. Bagels – I like Murray’s Bagels in Greenwich Village, on 6th Ave between 12th and 13th. It’s just West of Union Square. A close second, pizza! NY’s best pizza is a hotly debated. Di Fara in Brooklyn is very popular and serves slices. Slices in NYC are as big as your head. Be warned! For Vegan Pizza options, try Cafe Viva on 2nd Avenue between 11th and 12th St.
New York Magazine have a big feature on where to drink on each night of the week in NYC. The lobby lounge at the Mandarin Oriental serves cocktails and has an amazing view of Central Park. There is no need to limit your drinking to night time, New Yorkers are also very fond of drinking with brunch. Try the spiked coffee with brunch at Sons of Essex. To drink for free you can go to an art show opening. Try The Skint to find info. They’re often quite fun. You can just walk in, chat to people, and have a few drinks. Bryant Park is open very late at night for ice skating in winter. 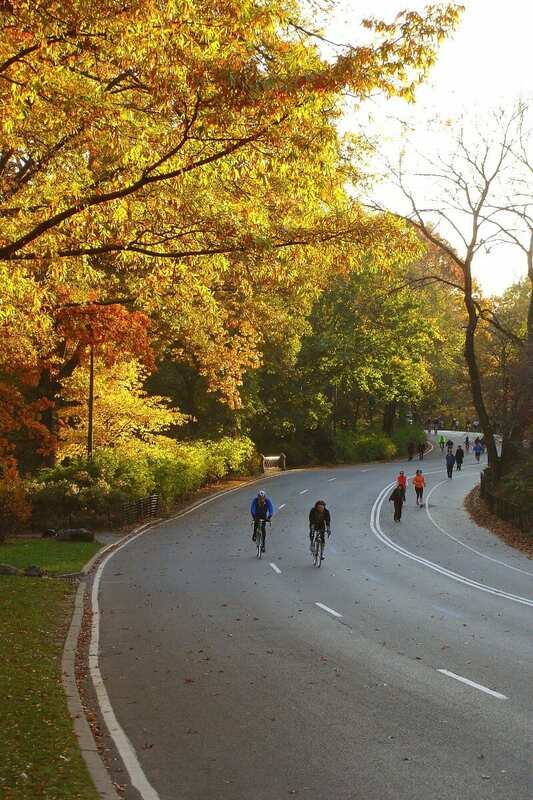 An alternative way to spend an evening is to do the free monthly 10pm bike ride around Central Park, or one of Times Up’s other moonlight rides. There are of course tons of clubs and bars if you’re looking for fun things to do in NYC of an evening. Try Motor City Bar if you like Dive Bars, or the previously mentioned Ace Hotel for something more lux. I get sublets using Craiglist or through friends. If you’re looking for a sublet and have any NYC-based friends, just ask them to do a Facebook blast on your behalf. Rent is so high in NYC that NYers are often keen to sublet. If I have any days before my sublet starts, I stay at the Hosteling International located at 103rd and Amsterdam (dorms only). It’s a really nice hostel. At the risk of this sounding like an ad for the Ace Hotel (it’s not), it’s a great mid-range hotel option for people who want to keep it classy. Their rooms start around $229, which is cheap for New York, and include free wifi. For a splurge (and possibly to tick an item off your bucket list), the uber famous Waldorf Astoria has surprisingly good rates. They start around $369 a night, but there are also some good packages around. 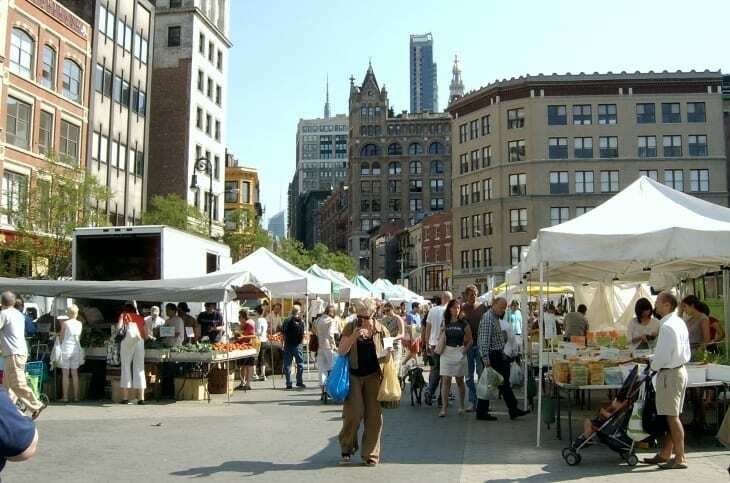 The Union Square farmers market is amazing in summer and one of the top things to do in NYC. It’s on Mondays, Wednesdays, Fridays, and Saturdays. Fridays are the best. For people from outside the US, the chain stores that I think are worth checking out are: The Gap, H&M, and JCrew. There is a JCrew in the Time Warner Center right next to the 59th St entrance to Central Park. There’s also an awesome Wholefoods supermarket in the Time Warner Center, with seating and even a microwave. Perfect for lunch or supplies for a picnic in Central Park (and for a clean toilet near Central Park!). There are multiple branches of The Gap and H&M. The Century 21 Discount store near the World Trade Center is good(ish) for designer labels at discount prices. Prices are probably better at designer discount stores in other states (such as Ross Dress for Less, which isn’t in NYC but is in places like LA and Vegas). My most fashionable friends like Soho, which is where you’ll find boutique shops. I’ve been in NYC for Gay Pride, Thanksgiving, Christmas, and 4th of July. The 4th of July Fireworks are cool but the public viewing areas are claustrophobically crowded. I’d be more inclined to avoid major events and festivals than seek them out. As a visitor, it’s a pain to work around attractions being closed for Thanksgiving and Christmas. The subway is incredible. I love it. You can buy a 7-day pass ($29) or a 30-day pass ($104). Unlike other cities, there are no zone restrictions. 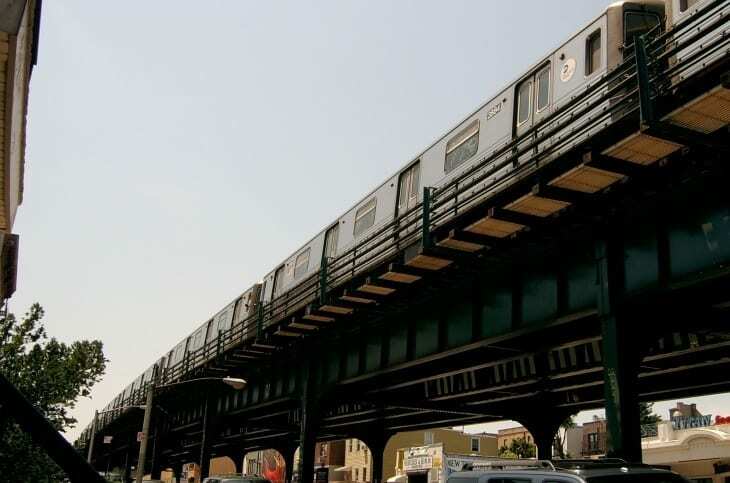 For the same fare, you can use any subway including to Brooklyn and Queens. A subway pass is also valid for the buses. With the exception of “crosstown” buses that travel east/west rather than north/south, I don’t generally recommend the buses though. You’ll just end up stuck in traffic. Google maps will give you subway directions if you click on the public transport symbol. There’s a reason why Sarah Jessica Parker has such toned legs (apart from wearing heels all the time)! NYC is an amazing walking city. A combination of walking and the subway is best. You can use WiFi at Starbucks and they’re everywhere. If you want to do work for the day, go to famous reading room at the main branch of the New York Public Library at 5th Avenue and 42nd St. There are plenty of desks, each with a power point. Most people say fall is the best time to visit New York City. I like summer in New York because there are so many free events taking place. Only go in summer if you like the heat. Temperatures in the 90s F/30s C are common. The weather is bleak in winter. There’s just too many things to do in New York City. These days I spend more time in Brooklyn than in Manhattan, so I would say Brooklyn as a side trip if you only think of NYC as Manhattan. But if you want to escape for a day or two, try one of these weekend getaways from NYC. You can easily fly into any of three airports. Kenndedy/JFK, La Guardia (LGA), and Newark (EWR). Transport links from all three are good. There are also cheap buses from Boston, Washington DC, and Philadelphia. Mega Bus is a good choice. My best insider tip on things to do in New York City is to find free events using The Skint. This will get you off the tourist trail if you wish to do that. Of New Yorkers! They’re generally friendly and helpful. There is a sense of anything is possible, people having self-confidence, and people living life their own way. Especially in Brooklyn, there’s also an amazing sense of highly concentrated creativity. New York is inspiring and energizing. Author Bio – 30traveler.com is a blog devoted to travel beyond backpacking, featuring short and long trips with a focus on vegan/vegetarian travel. You can also connect with Kate on her Facebook page and twitter. If you have already been, do you have any tips on things to do in New York City? What do you think are the top things to do in New York? What a great post. 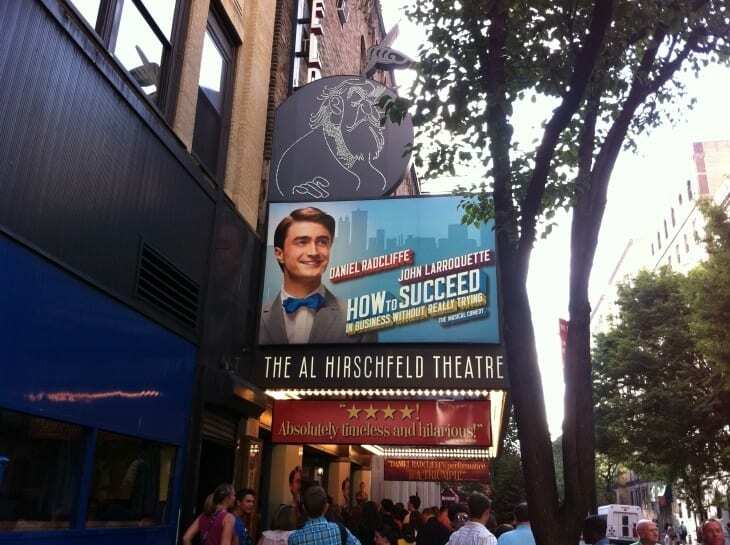 Love the suggestion on how to get cheaper tickets for Broadway plays as that tops my list of what to do in the city. I need to explore by bike the next time I’m there too. 1. For getting around, the buses — not just the crosstown ones — are a perfectly fine alternative for getting around most of the time. Outside of rush hour on weekdays on certain routes, they get you around reasonably quickly (and if you’re going down Second Avenue on Manhattan’s east side, there’s an express bus service called the “Select” bus). They’re also often less crowded than the subways, and you can get a cellphone signal unlike when you’re underground. Note, though, that Metrocards are not sold at bus stops. Thus, you will either need cash to pay the fare, or you’ll have to already be carrying a Metrocard (which would be the case if you’ve purchased a long-term pass). 2. An excellent site for planning your trip on NYC public transportation is hopstop. It generates directions and a map, which you can have emailed to you. You can generate routes for your preferred combination of subways, buses, and walking. I use hopstop all the time. 3. If you like Indian food, there’s an enclave in the East Village called Little India — a cluster of quality Indian restaurants on East 6th Street. They tend to provide excellent value, too. 4. The Astoria neighbourhood in the borough of Queens has many ethnic restaurants, including a good number that serve Greek food; and they tend to be reasonably priced. 5. Down at the southern tip of Brooklyn is Coney Island, a beachfront neighbourhood which has a great old-time boardwalk and some classic amusement park rides. The highlights are a ferris wheel called the Wonder Wheel that provides great views of the area, and an old rickety wooden roller coaster called the Cyclone. And within walking distance from Coney Island is Brighton Beach, a neighbourhood with a large number of Russian residents in which you’ll find some top-notch Russian restaurants. Coney Island takes a while to get to but it’s easily reached by subway and can be a fun excursion on a summer day. (Coney Island is also the site of the hot dog-eating contest you may have heard about that’s held annually on July 4). 6. If you like drinking in style, check out one of the rooftop bars in Manhattan, which can offer some terrific views, especially at night. Here’s a recent list of some of the best ones. Appreciate all the great extra tips. I really do want live in New York, even if it’s just for a few months. Have visited once before for 10 days over Christmas/New Years and can’t wait to go back. Cheers! Hey Kate, Top of the Rock is a definite must visit New York sightseeing spot IMO. It’s got breathtaking views overlooking Central Park and NYC itself. Highly recommended to any visitors to the city (at night is the best). However, a downside is that it does cost money. Thanks for the great ideas! Now I’m totally jazzed to go back to New York…sooner, rather than later. Thanks Caz and Craig for the opportunity to contribute to Ytravel. Am excited that this post is up to 250 stumbles already in less than 24 hours! What a fab,concise guide-great for people with little time(or money)! Craig, I think while visiting NYC I won’t need any guide because your Post is enough for me to note down the major activities to do in NY. Excellent post – so many great tips… can’t wait to try some of the restaurants on Kate’s list! We haven’t made it to a Broadway show yet but that’s one thing we’d love to do next time we’re in NYC. Great suggestions! Another great option when visiting NYC is Family In New York! They offer custom private New York tours! They will create a tour for you that is sure to show you the best of what New York has to offer! They are experts when it comes to this great city and a tour with them is sure to be the highlight of your trip! I thought this guide was supposed to be about things common tourists wouldn’t know to do? Central Park, Broadway Shows – come one EVERYONE knows to go there! Actually it is a guide called Things to do in New York City, not off the beaten path experiences in NYC. Not everyone has been to New York City before, nor knows everything to do. What is obvious to you may not necessarily be to EVERYONE–a term that really shouldn’t be used. It implies that you know everything about every single person’s experiences and needs. I know many people who have no idea of Broadway shows in NYC nor things they can actually do in Central Park. I think EVERYONE should know to go to the Botanical Gardens here in Sydney, as it is one of the most stunning gardens in the world, but plenty people don’t know about it, nor visit it. Hi, Love your blog, we have taken your advice to look at Craigslist for apartment rentals in New York, however there are some warnings about scams, how would I best go about conducting a transfer of funds or booking a room without being ripped off or finding myself in New York with no accommodation. We don’t want to spend money on accomm that would be better spent elsewhere so we are hoping to pick up a low price apartment. Any suggestions or advice booking online for apartments in New York the listings on Craiglist look amazing compared to that of airbnb, but worried that we are being fooled. Half Price Broadway AND Yankees Tickets – yep, in Times Square, you can get same-day half price Yankees Tickets. And just about any Broadway show available at TKTS (the half price booth) will also be available at 30% or more off – online and in advance! Don’t waste your vacation on a long line for a marginal savings. 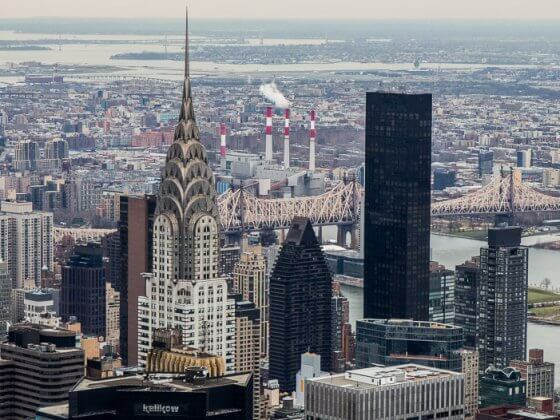 NYC Vacation Rentals – these are tough, because they are mostly illegal. Doesn’t mean you can’t find a great deal (many of my friends have), but it likely means you are taking a risk. There are definitely some great vacation rentals in great neighborhoods with no legal risk. Be cautious and research thoroughly. If it sounds too good to be true (eg – sleeps six, in Manhattan, for $100 per night) IT IS! For shopping, locals just LOVE NYC Sample Sales – each brand usually offers them about 1-2 times per year. But it is where all the locals shop and how they get Louboutins, Manolos or Jimmy Choos for $100+. 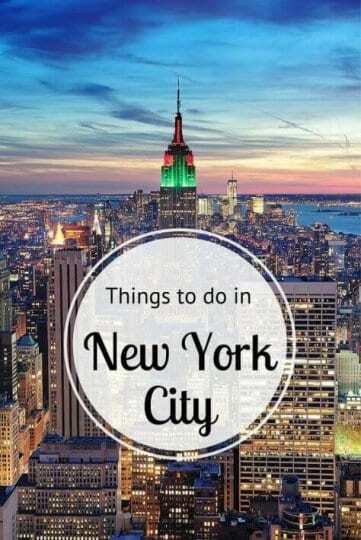 Caz, this is a great list of Things to do in New York and as a visitor from the UK I will recommend it to all my friends. We all have our favourite things to do in New York, its the size, variety and choice which makes it so fantastic. There are amazing museums – the Frick Collection is wonderful and my wife and I really enjoyed the Evening Jazz Cruise. We’re putting together our own guide of New York and will be adding more information after our visit next week. 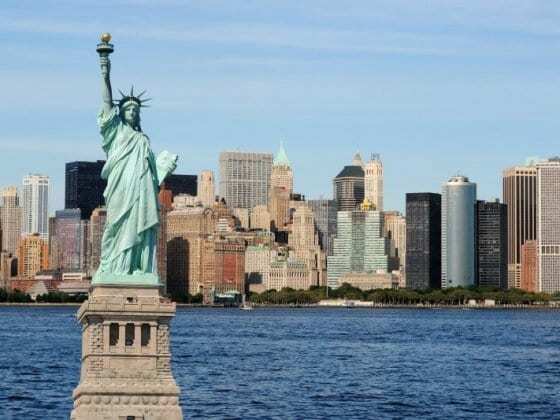 Some great tips getting back to NYC in October we got a great flight offer with Tour America. I am wondering about easiest way to tour when u can’t get out there and walk freely. 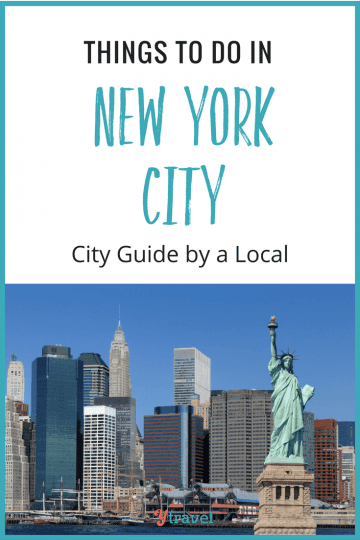 You really covered just about everything there is to know about New York to get a great vacation planned. I just wanted to let you know about a small boutique hotel that you probably haven’t come across in your travels. The Park House Hotel in Brooklyn, NY is a great spot for a family stay or someone looking for a budget-conscious alternative with easy access to the New York attractions. Your post makes me want to visit NYC right now! Great tips! I am always searching for deals. For NYC I use the guide book 365 Guide. It lists restaurant deals and bar specials. http://www.365guidenyc.com Saves me a ton. Oh, how I wish to live in New York City! Just merely looking at the photos you posted makes me want to get away right away in New York City. I can’t help but imagine myself to be in this big room where there are colorful bright lights watching the big glitzy broadway shows, that must be really awesome. And to top that out, I can get a discount while having a good seat to experience this. Thank you for mentioning it in your blog. I can’t wait to visit this fancy city soon. Hi! I’m going to NY on July. How can I reach NYU from La Guardia? A taxi maybe? How much does it cost the ride from there?? What activities or shows do you recommend on July? Thanks! There was a bus that would take you from the airport to Grand Central. From there you could take a taxi or the subway #4,5, or 6. 4or 5 to 14th street, Union square and walk 10 blocks or transfer to the 6 and get off at Astor Place (8th St). Avoid traveling with baggage during rush hour. July is good for renting a rowboat in Central Park, street fairs on weekends, green market, Shakespeare in the Park, or there used to be Shakespeare in the parking lot somewhere around Eldridge St. South of Houston (pronounced house-ton, not like that town in Texas). I love the Statue garden at the Met. Museum of art, the high line, the Irish famine memorial in battery park city. Rent bikes and you can ride along the Hudson and East rivers on paths. Have a great time! Thank you so much for this post. I will be doing some traveling to New York very soon, and coming from a very small farming town, the Big Apple is quite daunting. I appreciate this information. It was MUCH NEEDED for us small town gals. Da Nico in Little Italy is a must!! Went there last year and it was just amazing. Good was delicious, my father and uncle got a HUGE seafood pasta for $50 with clams, muscles, lobster tail, crab, etc. very under priced for what you got. Hey Kate, what a lovely post it is. Thanks for sharing such a nice information with us. New york is such a beautiful city as I have ever seen. I was in new york last year with my family. Had lots of enjoyment with my family. I know its been two years since you wrote this blog post but I really must say that I appreciate it. My family and I will go to New York this spring. We are a Swedish family and we used the swedish site hyrboende.se to find us an apartment on Manhattan. 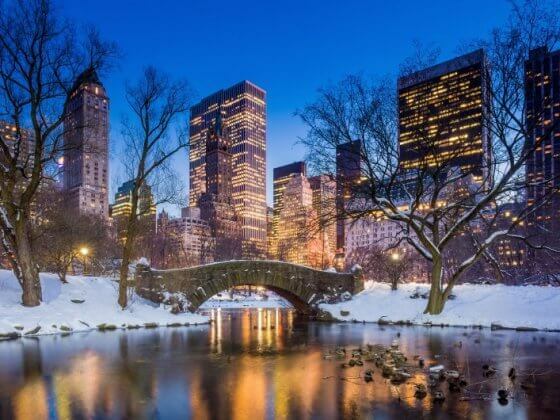 Many of the things like Central Park and Broadway is a must see when we get there, is the http://broadwayworld.com/grosses.cfm#sthash.qCc7DuPG.dpbs still the best site to buy cheap tickets? Exciting Vanessa. I’m sure all you guys will have a great time in NYC! Excellent post, thank you so much! Found it via Pinterest. I’m heading to NYC for my 30th birthday this May (for 11 days) and it will be my first time visiting. This is very helpful, thanks again! Wow!!! Just as others have said…this is a great post. All of the details are explained well and I’m so excited about my next trip in the spring to this amazing city! You like New York because of the people?? Are you kidding me?? Never met a more rude and horrible type of person in the world than New Yorkers!!! Well everyone is entitled to their opinion and perspectives. I’ve heard many people say that about Parisians as well, but I found them to be the total opposite. I think it just depends on how open you want to be to finding those positive experiences. I hope next time you are in NYC you find those lovely people. I think Humans of New York shows just how incredible the people of New York are. It might be one to check out. You can also access the TKTS booths at South Seaport and downtown Brooklyn. If you are looking for cheap double decker hop on hop off tours do not hesitate to visit us at 2 E 42 ST New York NY 10017. Lowest price guaranteed on most NYC attractions and tours especially nyc hop on hop off. I am visiting NYC in early June, 15. booked the Holiday inn at 99 Washington Street (Financial District). Is that area safe? I saw your post shows at the tip of Manhatan is not cool, that concerns me. Also, with all of the travel tips on spotlights, do I really need to buy Hop-On-Hop Off bus tour? This is great. The most to the point article for anyone coming to New York City. I especially like tips like side favorites. I have been using this article and help from folks at http://www.unwander.com. Check out all the speakeasy bars and all the Ramen places like Ippudo, Toto ramen. Man I am in love with this city. I cannot thank enough for this great article. It saved me so much time planning. Wonderful article thank you. I am traveling to NYC with my fiancee next month. Looking forward to our trip. I am not a big fan of chain hotels, they all seem so sterile. I noticed your recommend the ACE hotel. The last hotel recommended that hotel as well. You seem to have a similar travel personality to me. Any other thoughts on independent hotels I might like? Looking for some authentic advice. That is an amazing over-view. I could get time to visit One World Observatory, Times Square, Central Park in my current visit to New York. It would also be interesting to know how we can decide the travel places according to which part of the year we are visiting. P. S. New York is that game of chess ( streets and avenues ) where everyone thinks they are playing but actually they are the pieces. I would love to visit rest you mentioned in my next visit. Thanks for those tips. Great work. I and my family traveled from Seattle, WA and we enjoyed our NYC trip. Thanks for sharing! Thanks for this post. Super useful and great links!! !